One of my absolute favorite flavor combinations is sweet and salty. Sit me down with some potato chips and a handful of M&Ms or chocolate-covered popcorn and I’m in trouble! So you could imagine the level of my excitement when I flipped through Baked: New Frontiers in Baking for the first time and saw my nemesis flavor combo in a cake. Add some salted caramel to a chocolate cake and I’m pretty much done for. Now admittedly, I’ve had this cookbook on my shelf for well over a year and I’ve yet to make the cake. It’s hard to justify making a whole cake for only two people just for the heck of it so the cake has ended up sitting on my list for what seems like forever. And then came Courtney’s Virtual Baby Shower. Among the many reasons why Courtney and I are such great friends (real-life friends, not just blogging friends! ), I firmly believe that our love for Baked’s cookbooks links us together. And while I’ve never visited the famous bakery in Red Hook, Brooklyn, Courtney and her awesome husband, Eric, did a few years ago during a trip to NYC and they had a blast. (For the record, I’m jealous.) This cake is perfect for Courtney. She is seriously one of the sweetest people I’ve ever met and would go to any length to help a friend, but she’s also got this “salty” side, a sense of sarcasm, dry humor, and frankness that I adore. I was lucky enough to be able to spend a whole weekend with Courtney this past weekend with Josie and Annie in Richmond when we surprised her with a visit for a real-life baby shower. It was an insanely fun girls weekend filled with soothing Southern comfort food, a chocolate shop that blew us all away, tons of laughs, and so many memories I have to cherish with some of my best friends. 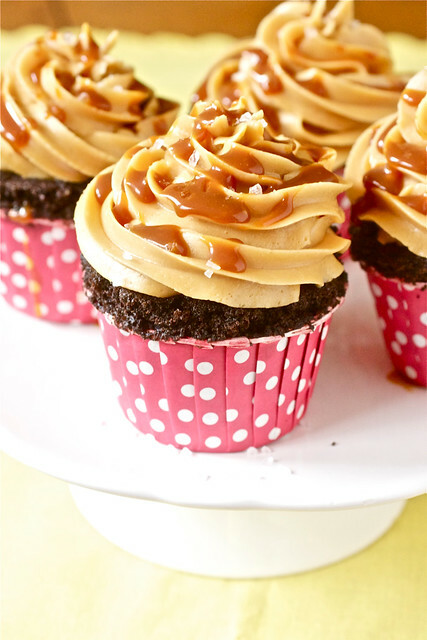 These salted caramel cupcakes are truly an outstanding creation. I used Baked’s sweet chocolate cake recipe (next time I’ll use my favorite chocolate cupcake recipe as I miss the domed cupcakes) and merged it with Sweetopolita’s recommendation of a salted caramel Swiss buttercream. Need I say anything else? Rich, sweet, salty, dreamy. Perfect for my dear friend Courtney as she prepares for baby C’s arrival in the next few weeks. Courtney, pour yourself a glass of milk, put up your feet, and enjoy! Josie from Pink Parsley is hosting Courtney’s shower to be sure to head over there (and to Courtney’s blog as well!) to catch up on all of the other amazing treats nearly 15 other fabulous food bloggers have contributed to the shower! Preheat oven to 325 degrees F. Line two 12-well muffin tins with paper cupcake liners. In a medium bowl, mix the cocoa, water, and sour cream together. Set aside. In another medium bowl, sift the flour, baking powder, baking soda, and salt together. Set aside. In the bowl of a stand mixer fitted with the paddle attachment, beat the butter and shortening together on medium speed until ribbons form, about 5 minutes. Add the sugars and beat on medium for another 5 minutes, until light and fluffy. Add in the eggs, one at a time, beating into the batter before adding the next one. Mix in the vanilla. Scrape down the sides of the bowl and beat on medium-low for 30 seconds. Add the flour mixture in three separate additions alternatively with the cocoa mixture, beginning and ending with the flour mixture. (I.e., flour, cocoa, flour, cocoa, flour.) Divide the batter evenly between the cupcake liners, filling each about 2/3 full. Bake for 18-25 minutes, until the toothpick test comes out clean. Transfer the pans to a wire rack and allow them to cool for 10 minutes before removing the cupcakes from the pan. Cool the cupcakes completely on the racks before frosting. Place 1/2 cup + 2 tablespoons of the sugar and the water in a medium sauce pan and bring to a boil over medium heat. Brush down the sides of the pot with a dampened pastry brush to prevent sugar crystals from forming. Cook until caramel is a dark amber color, gently swirling from time to time. Remove from heat, and slowly add cream, whisking by hand until smooth. It will bubble vigorously, so be careful. Whisk in the sea salt. Let cool completely. In the bowl of a stand mixer fitted with the paddle attachment, place butter and beat on medium speed until pale and fluffy, about 3-5 minutes. Transfer to a large bowl and set aside. Wash and thoroughly dry the mixing bowl and add the egg whites and remaining sugar into the bowl. Place the bowl over a pot of simmering water (not boiling). Whisk occasionally and gently until sugar dissolves and mixture registers 160° on a candy thermometer. Remove the bowl from heat and place back onto the mixer fitted with the whisk attachment. Whisk on medium speed for 5 minutes. Increase speed to medium-high, and whisk until stiff, glossy peaks form (about 5-6 minutes). Once the bottom of the bowl is neutral and no longer warm to the touch, reduce speed to medium-low, and add beaten butter, a couple tablespoons at a time, whisking well after each addition. With mixer on low speed, add most of the cooled caramel (reserve a few tablespoons for drizzling, if desired), and beat until smooth (about 3-5 minutes). 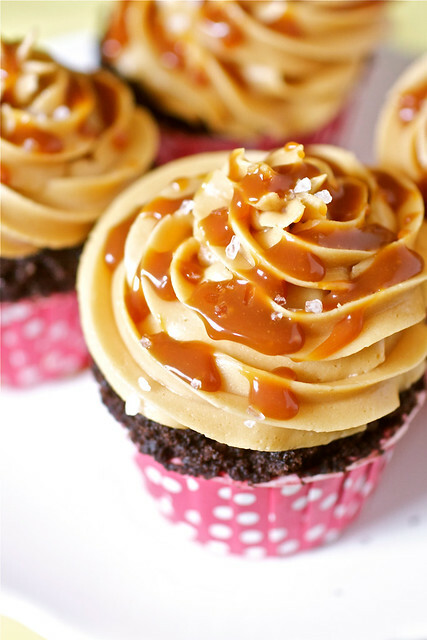 Frost cupcakes as desired and drizzle with remaining caramel. Yields: about 24 cupcakes. For generously frosted cupcakes as shown above, increase the frosting recipe by 50%. To make the cupcakes: Preheat oven to 325° F. Line two 12-well muffin tins with paper cupcake liners. In a medium bowl, mix the cocoa, water, and sour cream together. Set aside. In another medium bowl, sift the flour, baking powder, baking soda, and salt together. Set aside. To make the frosting: Place ½ cup + 2 tablespoons of the sugar and the water in a medium sauce pan and bring to a boil over medium heat. Brush down the sides of the pot with a dampened pastry brush to prevent sugar crystals from forming. Cook until caramel is a dark amber color, gently swirling from time to time. Remove from heat, and slowly add cream, whisking by hand until smooth. It will bubble vigorously, so be careful. Whisk in the sea salt. Let cool completely. What a great selection for the shower, these cupcakes sound amazing! I love sweet and salty desserts. I really need to live closer to people who participated in this shower because everything looks so amazing. These are probably my absolute favorite, though, and I could definitely go for one (or two) for breakfast. These are so lovely! Great idea! Oh good heavens, Tara–these look insanely decadent! I know Courtney wishes she could have one of these for real RIGHT NOW! Wow! Tara, your reasons for choosing sweet and salty cake are perfect, and I think your description of Courtney as “sweet and salty” herself is spot-on. Love it!!! These look fabulous. First – I totally love these. And I’m thinking maybe we just need to take a trip to Baked together. Sweet and salty is exactly what I’m craving right now, so I can’t think of a more perfect dessert. Second – Your description of me is hilarious. Way to keep it real. 🙂 I’m so glad we got to hang out last weekend, and I can’t wait for you to meet Baby C! This flavor combination sounds ridiculously amazing. I feel like diving head-first into your pictures. That caramel (all shiny and creamy) with that salt on top? HEAVEN! Love the pics! Yum! I need like 3 of these. I love the sweet/salty combo too and these cupcakes look divine! This looks and sounds like the perfect dessert for me 🙂 I love sweet & salty combo, and I´m a sucker for a great cupcake. Need to make these asap! Your blog is so amazing and inspiring, thanks so much for sharing all these beautiful and delicious recipes! I’ve been wanting to try that very same caramel buttercream frosting recipe! Dang, these look great! Wish I was there to sample them! I have to agree, I like a domed cupcake as well. I’m really going to have to try these. I haven’t tried a Swiss Buttercream before, but I think I’m going to have to make this! I want to frost a layer cake with it. I assume I should go the extra 50% as you recommended for generously frosting the 24 cupcakes or should I double the recipe? Man that’s a lot of butter! Sue: Yep, it’s a lot of butter but the good thing is that extra buttercream keeps well in the fridge and can be frozen! I’d say go with the extra 50% just to be safe.